Captain Marvel, finds herself caught in the middle of an intergalactic battle which takes her to Earth in 1995 which opens up her mind to her past. As fan of classic Marvel comics, I must be honest and say (Thor Ragnarok aside) I haven’t been a great admirer of the arguably padded out borderline pretentious film outings. Thankfully, directors Anna Boden and Ryan Fleck’s Captain Marvel is one of the better more enjoyable instalments introducing shapeshifting aliens Skrulls and the Kree, powerful humanoid warriors. With great acting, smouldering likeable blonde Brie Larson is fantastic as Captain Marvel which expands the Marvel Cinematic Universe and ties into a past story thread, namely the Tesseract cube and future threads, including Fury’s pager. There’s a great performance with plenty of screen time from Samuel L Jackson as de-aged Nick Fury, oozing screen presence Jude Law and mostly prosthetic makeup Ben Mendelsohn are particularly note worthy with their characters offering some story twists. There’s fantastic action, effects and music throughout – it’s one of the better stories of any MCU with an interesting 90s setting and top pacing as Fury and Marvel team up. As expected there’s some end credit scenes The first will connects to Avengers: Endgame and the humorous second bookends the film. Overall, a solid superhero actioner, you can’t go wrong. Humankind’s only hope against mindless flesh-eaters, referred to as ‘hungries’ is a child and a group must survive to develop a vaccine. 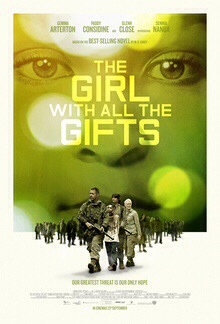 Colm McCarthy The Girl with All the Gifts offering echoes particularly the likes of 28 Days Later and World War Z. There’s a fitting eerie vocal injected score by Cristobal Tapia de Veer. The CGI is effective and thankfully used sparingly. The make up and gore effects are solid as the group escape a base and journey through post apocalyptic London. Young Sennia Nanua as Hannibal Lector-like masked Melanie is believable as the infected girl, there’s an excellent dry wit performance from the underused Glenn Close. Gemma Arterton gives 110% and to her credit acts her chops off. Notable is reliable actor	Paddy Considine as Sgt. Eddie Parks who provides much of the back bone of the bleak film. McCarthy’s direction is on point and even though the plot and visuals are familiar there’s enough new ground and good acting on display to keep interest. That said, the deviating latter half possible sacrifices hardened zombie fans. After a homeless person is bitten a zombie virus spreads rapidly and a woman must reunite with her boyfriend while her father also searches for her. From director Yeon Sang-ho, packed with social realism especially around gender, this is an animated prequel to Train to Busan. Seoul Station is refreshingly different from its predecessor. It’s avoids stereotypes, has plenty of tension, atmosphere, has all the blood, guts and violence you’d expect but also has a solid twist at the end. The studio appears to have scrapped their version and adopted the Director’s Cut as the standard which can be streamed 0n Amazon. Highlander Connor MacLeod must reveal the truth about the Earth’s anti-ozone shield while fighting some immortals sent from the past. It lacks the danger and finesse of the original, but thankfully the new Highlander 2 edit with updated effects makes this troubled and poorly executed sequel at least watchable, compared to the original theatrical release. Michael Ironside and supporting cast give distracting, larger than life theatrical performances. Sean Connery lights up the screen, and Christopher Lambert is notable especially in the aged make-up. Virginia Madsen comes off in the best light, although she is not given enough to do, going from strong feisty conservationist to love interest in a blink of an eye. Nevertheless, the script is poor and the editing is still choppy. The film has a serious pacing issue which no amount of re-jigging can correct. It has some redeeming qualities, the sets and score are excellent and director Russell Mulcahy gives some fantastic sweeping shots. The new cut now makes sense; for example why MacLeod becomes immortal again, hinting that he has forgotten a past, prior the setting of the first film, and gone is the idea that Ramírez and Connor come from another planet. 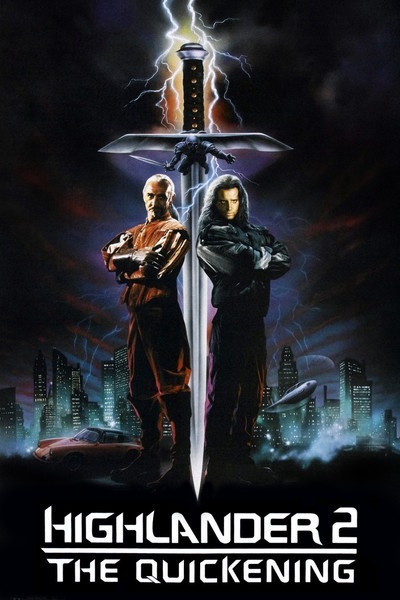 If you must watch Highlander 2, avoid the ‘The 1991 Quickening’ version at all cost and watch the 2010 blu-ray release and the version currently streaming on Amazon . Although it’s far from a kind of magic. A young man sets out in search of medicine for his mother aided by a hi tech android. Don’t expect the grandeur of Mad Max: Fury Road, Future World is more in the vein of 1980’s Italian produced films which borrowed from Mad Max Road Warrior. Mix James Franco and Bruce Thierry Chung’s offering with a bit of Automata and Cherry 2000 and you get a decent direct-to-video science fiction action Western film. The editing is pretty slick, Franco covers plenty of ground and refreshingly there’s little CGI. Peter Zeitlinger cinematography does what it can with the minimal locations. The screenplay by Chung and Jay Davis screenplay recycles many sci-fi tidbits right down the The Running Man Wedlock-like controlled slaves. Both Snoop Dogg and Milla Jovovich are entertaining enough in their small roles. Franco hams it up as the Warlord and Suki Waterhouse as the android girl, (while not good as Caity Lotz in The Machine) carries the film well enough picking up the slack from Prince (Jeffrey Wahlberg). Toydrum’s score is also notable. Overall if you enjoy Warriors of the Wasteland, 1990: The Bronx Warriors (1982) and the like, this is a forgettable updated slicker version which doesn’t pretend to be anything more. On the run in 1987 Bumblebee seeks refuge in a small California beach town aided by 18 year old. At last a Transformer film we’ve been waiting for, granted it’s smaller with more personal and self contained battles. It’s probably the best autobot outing since the original animated Transformers the Movie. Thankfully The Transformers look more like the Generation 1 we fell in love with, reaffirmed with an opening of an excellent Cybertron war which we also see more of in a flashback midway in the running time. It’s funny and heart warming with some great action littered throughout. Along with the setting, props and the like it’s packed with 80s music giving it a great retro vibe. Even though the Military are a bit hammy it echoes the cartoon series’ tone. In the closing act a moment on the Goldengate Bridge offers nostglia overload followed by another scene in a forest. Overall, a great Transformer movie with plenty of heart with a story which makes the Transformers fun and exciting all over again.